We all know how deteriorating to our health, passion and even dreams fear can be. But we may not totally be aware of some truths about it. You may want your fear to go away at once, but don't be disappointed if it doesn't. Fears are always at the corner and everyone does feel it. Susan Jeffers, Ph.D shared in her book, "Feel the fear and do it anyway," some truths about fear. As long as you continued to push out into the world, as long as you continued to stretch your capabilities, as long as you continued to take new risks in making your dreams come true, as long as you try to live your passion, you are going to experience fear. My statistics tutor usually say that, there are three things you can do to your problem. One, you can face it, two you can play with it and three, you can run away from it. The popular saying says, face your fear. That is the best thing you can do to it. If you are afraid of making friends, go out and face it. If you are afraid of speaking in front of people, go out and try it. let's illustrate it like this. Do you know that a mountain far away from you is bigger and taller than when you are closer? That is how fear is. When you look at it from afar, it will look big, but the moment you move closer and face it, it begins to diminish. The doing it comes before the feeling better about yourself. When you make something happen, not only does the fear of the situation go away, but also you get a big bonus: you do a lot toward building your self-confidence. It's fairly predictable, however, that when you've finally mastered something and gotten rid of the fear, it will feel so good that you will decide that there is something else out there you want to accomplish, and—guess what! The fear begins again as you prepare to meet a new challenge. Whenever you try to break new ground, make new changes, you are going into an unfamiliar territory. Your comfort zone is a territory you are familiar and comfortable with. Whenever you decide to move out, you will experience fear. Truth 5: Pushing through fear is frightening than living with underlying fear that come from feeling of helplessness. No matter how secure any of us feel in the little cocoon we have built for ourselves, we live, consciously or unconsciously, with the fear that the day of reckoning will eventually come. People who refuse to take risks live with a feeling of dread that is far more severe than what they would feel if they took the risks necessary to make them less helpless—only they don't know it! Do you know what is keeping you in that job and relationship you don't enjoy again? Yes, it is fear. Below are some tips to help overcome your fear. Whether you are religious or not, prayer has the best healing powers. Telling the MOST HIGH about your fear/problem is the best thing you can do. Know what you are afraid of. Only when identified can you face it. Talking about it makes you feel relaxed. Also by sharing with people who you trust, will help a long way. That is why is it of utmost importance to surround yourself with the right set of people. Answers to our problems have been provided by those who has experienced such before us. Is it a fear of particular topic that is killing you? Take a book and read. A simple Bible verse like Psalm 23, "The lord is my Shepherd......will do a great deal. Verses like, I can do all things through Christ who strengthened me. Think positively and act positively. You are what you think. Always think of possible ways not the other way around and stay positive. 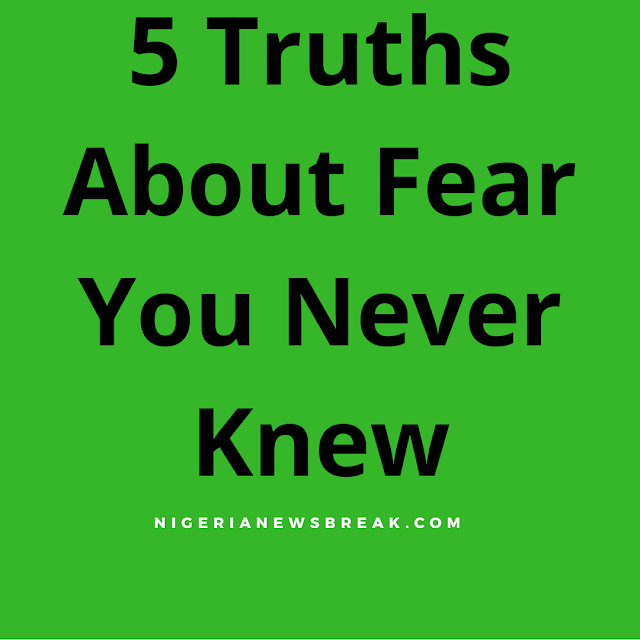 Whenever you go out, always remember these truths about fear. Your imagination creates the fear, it is not real. Remember, you can do all things through Christ who strengthens you! How have you been dealing with fear in the past?